The Korean-language version of Wikipedia, pro-democracy literature and entertainment were among the contents on USB sticks recently sent via balloon into North Korea. 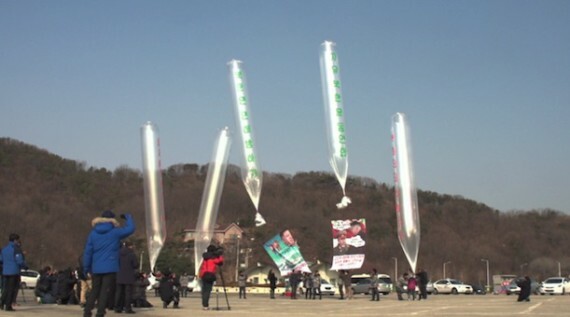 Twenty balloons, each carrying several large bags of propaganda materials, were launched on Wednesday from Paju, close to the inter-Korean border, according to Human Rights Foundation, a New York-based NGO that focuses on closed societies. “These balloons are an information lifeline to ordinary North Koreans, who have no means to learn about the world beyond the lies of their government,” said Thor Halvorssen, president of HRF in a statement. The bags collectively contained around 500,000 leaflets, DVDs with South Korean TV dramas, radios that can be tuned to listen to foreign broadcasts and the USB sticks, said HRF. Balloon launches across the border have been going on for several years. The bags of propaganda typically have timers that release their contents at preset times when they are likely to be over North Korean territory. The hope of the human rights groups that launch them is that the contents of the bags scatter over a wide are and are picked up, read and used by North Korean citizens. HRF said it had originally planned to launch materials across the border in June 2013, but the launch was blocked by South Korean police. At the time, North Korea’s state media issued threats against groups planning the balloon launch and the South Korean government prevented it from happening apparently to reduce tensions between the two countries.